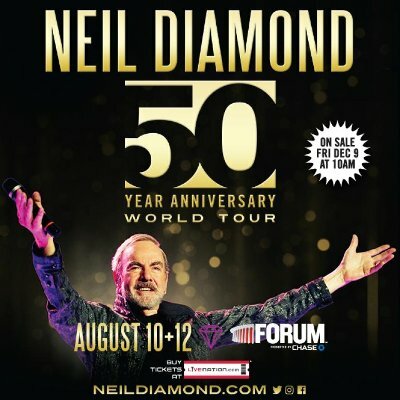 Grammy Award winner Neil Diamond is celebrating his unparalleled career spanning 50 years with his current 50 Year Anniversary World Tour, and when the music icon performs the final U.S. show of the tour at the Fabulous Forum on Saturday, August 12, it will mark the 35th concert at the Forum for the Rock and Roll Hall of Famer, the most any artist has ever performed at the legendary venue. Neil Diamond is no stranger to Forum milestones – the first was set in 1983 with his seven night engagement at the Forum, setting the record for most arena shows in a single run. Diamond then broke his own record when he performed 10 concerts at the Forum, from June 28 through July 10, 1989. The Forum concerts on August 10 and August 12 are his 34th and 35th performances at the historic Forum.